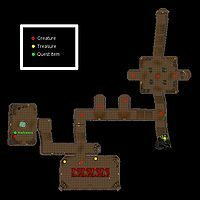 Nchurdamz is a Dwemer ruin located to the east of Molag Mar and near another Dwemer ruin of a similar name, Nchardumz. 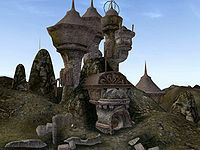 This ruin is somewhat small, consisting only of one area, even though it's populated by eight Dwemer constructs and one unique Daedroth called Hrelvesuu. This Daedroth is the target of Hrundi's first Fighters Guild quest and other than that, there are not too many reasons to visit Nchurdamz. However, a few items can be found here: a Nordic iron helm, a few pieces of iron armor, a Dwarven mace, a bonemold shield, a silver war axe, two glass arrows, the unique spear Illkurok, a Scroll of Healing, and some other random loot. In the first dead end corridor there's also a vein of glass where a few pieces of raw glass can be harvested.